Here’s how to implement these six training elements into your training on a day-to-day and weekly basis. First and foremost, recovering from hard workouts is paramount to giving your body the time it needs to adapt to training stimuli. Training is like planting a garden: plant the seed with the workout, but give the seed water (food) and time (rest days) in order to grow. Over time the seed will grow just like your power output will increase. I like to prescribe at least two rest days per week when athletes are performing hard mid-week workouts and training hard on the weekend. Mondays and Fridays make the most sense for athletes working a standard Monday through Friday 9-5 job. Resting on Monday helps the athlete recover from the weekend and prepare for mid-week training and taking it easy on Friday give athletes the ability to throw down on the weekend. Identify the power demands of your A race and train specifically for that race. If your training for a crit, incorporate crit-specific training like sprints, anaerobic capacity intervals and motorpacing to name a few. If you are training for a time trial, threshold intervals are the name of the game. You can even design full gas threshold intervals specific to the projected winning time. For example if the expected winning time is 20 minutes, do 2 x 10 minutes on, as hard as you can go, with 5 minutes off in order to train specifically for that time trial. I like to call this course recon and it is very important to know the race course you will be competing on. To know where a hard climb ends or where the finish line is crucial for athletes to implement tactics and strategy during the race. Furthermore by knowing how hard they have to go and when they’ll be able to stop or finish the effort helps athletes give a maximal racing winning and personal best effort. Here in Colorado we have a road race that has 2 key climbs. We’ll have athletes combine number 2 and 3 into one workout by performing VO2 Max Intervals from the bottom to the top of the 2 climbs (which we know are 2-4 minutes in length) on the race course. It’s a two-for-one training workout because they get to know the course and are training specifically. Group rides are great for training especially if you can analyze the power output of the spirited sections and evaluate how specific the group ride is for preparing an athlete for an upcoming race. Even better is if the group ride uses some of the race course! 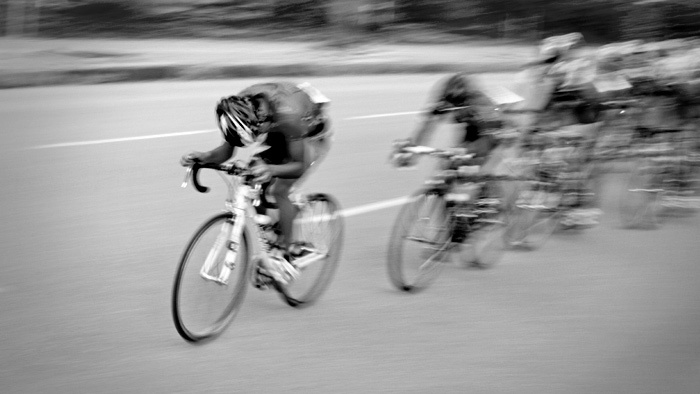 In any case, group rides tend to round out an athletes’ training for the many scenarios that may play out on race day: breakaways, splits, crosswinds, counterattacks and sprints to name a few. This is a chance for the athlete to test themselves out and identify strengths and weakness to work on before the A race. It is also a chance to train specifically (# 2). For Time Trials, look for a mid-week time trial series or a B race weekend time trial. Monitor your average and normalized power outputs for these TT’s. For criterium preparation make sure you get at least one or two training crits under your belt not only for training (#2) but also for skills practice like cornering, accelerating and pack riding not to mention race strategy. This is the preparatory workout that follows a rest day and is performed the day before your race. An example opener workout is 4 x 45 seconds on, as hard as possible, 90 seconds off during a 1 hour ride. If possible, I recommend that the athlete incorporate the 2nd and 3rd element and perform the opener workout on the course or similar terrain. For hill climbs and time trials I like for the athlete to get specific (#2) and perform 2 x 3 min on 6 min off at their pre-discussed race pace wattage. Overall there are many many ways to incorporate these six training techniques into your training plan. While every athlete has to consider their individual needs and situation, almost universal is an off day on Monday followed by another rest day 2 days prior and openers the day before the race. What happens in-between is good quality coaching through careful planning, day to day monitoring and most importantly of all, communication between the athlete and coach. Looking for a plan to get you ready for your “A” race? Download one of FasCat Coaching’s many training plans for all levels here.